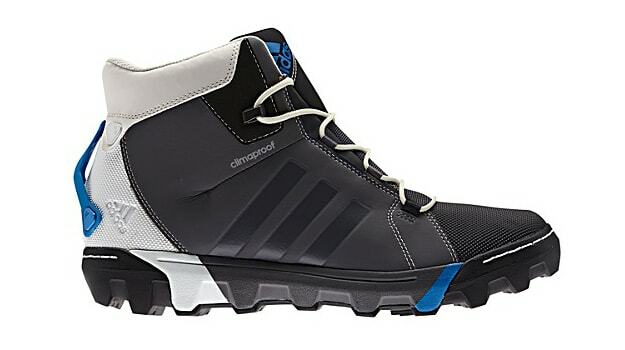 It seems like forever ago since Sneaker Report did a first take on the adidas SlopeCruiser CP boot. But now, nine months later, the latest technical boot from adidas Outdoor has finally hit the market. Available in two initial colorways—Black/Ray Green and Sharp Grey/Sharp Grey—the SlopeCruiser CP is a heavy-duty boot designed to take you from winter city streets to the icy backcountry as seamlessly as possible. The boot features a durable waterproof construction for all-weather use, but is still breathable thanks to a ClimaCool upper for all-around cooling (yes, your feet are still prone to overheating even in the blistering cold. Its mid-top construction offers protection from debris, as well as extra ankle support on rugged, uneven terrain. For traction, adidas has given the boot is high-grade Traxion rubber outsole with thick, aggressive lugs for ground-hugging traction.